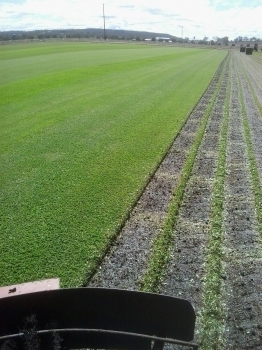 Rivendale Turf is a friendly, family owned and operated business. We have been operating for over 8 years now in the picturesque town of Inverell, Northern NSW, but have been in the farming industry for over 30 years. We decided to join with Lawn Solutions Australia, (a hand picked group of the best turf growers in the country) because of the branding, and we needed to, to continue growing our favorite turf grass, DNA Certified Sir Walter. We currently service several Councils and Landscape contractors. We look forward to providing you with your new lawn, whether it be DNA Certified Sir Walter or Eureka Kikuyu.